Rio de Janeiro throws the biggest, most raucous and most animated pre-Lenten festival in the world, so it’s not surprising the city’s streets are filled with music, dance and refreshment for five days leading up to Ash Wednesday. Rio’s 2012 Carnaval begins on this Friday, February 17, and runs through Fat Tuesday, February 21. While the samba competition at the Sambódromo stadium, for which samba schools practice year-round, is the most famed of Carnaval’s samba competitions, it’s the blocos – the street parades and parties – that keep Rio’s neighborhoods cheering and celebrating through Fat Tuesday. During Carnaval incredibly designed and decorated floats move along the streets of these neighborhoods, surrounded by dancers in the colorful, elaborate, and skimpy samba costumes that have become so symbolic of this revelry for the rest of the world. All along the way revelers dance and drink and the bandas, the samba bands, are heard blocks away. Since Carnaval takes place in the midst of the South American summer, it gets very hot. While a beer or caipirinha (the latter made with lime, sugar and the Brazilian rocket fuel called cachaca,) won’t cool you down, it helps many forget just how hot they really are, which is likely why cerveja and caipirinhas flow so freely in the streets and restaurants, and at the festival’s balls. Everywhere you can smell street-vendor snacks and sweets, as well as Brazilian barbecue. Barbecue is Brazil’s national sport and one of my favorite places to eat at in Rio is the Montana, an authentic churrascaria where servers bring a myriad of barbecued meats on skewers to the table. At the Lagoa Rodrigo de Freitas, a restaurant-speckled lagoon, friends and families eat, drink and listen to the live music. Brazilians are very family-oriented and it’s not uncommon to see young children in the nicest of restaurants in the early evening. 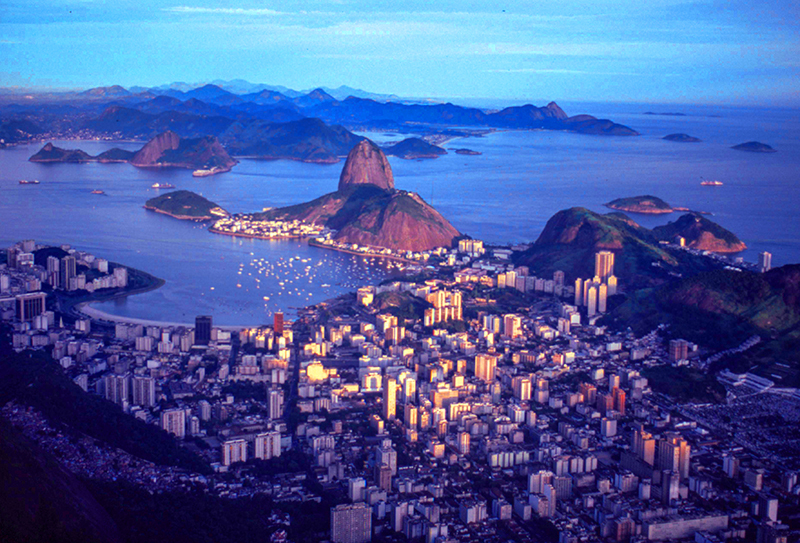 Most tourists base their stays in one of Rio’s celebrated beach areas, such as Copacabana and Ipanema. “Copa’” has hotels and apartment rentals in every price point. While Copacabana and Ipanema are the areas most known to tourists, there’s much more to Rio de Janeiro. Leblon is very upscale and Barra da Tijuca is emerging as a trendy resort area frequented by super-models, TV and movie stars, and professional athletes. On the beach there, vendors sell clothing and ice cream from rolling carts. “Barra,” well away from the madness of Copacabana, is sparkling clean, safe and a magnet for the well heeled who want to get away from the tourist crowd. A taxi from Barra to Copacabana takes about 30 minutes, progressively longer as the traffic gets heavier. Praia do Pepe is where the upper-crust gather in Barra. Nearby, in the Praia shopping center, my Brazilian-born daughter-in-law took me to a sandal shop that had the most jaw-dropping shoes. There were also a perfumerie and clothing stores there. Back in Rio on Corcovado Mountain, the awe-inspiring statue of Christ the Redeemer, his arms outstretched, stayed with me even after my descent by train from the mountain. It’s stunning to stand beneath the statue, gazing across the blue sea below. Sugarloaf Mountain, whose cable car makes a mid-way stop before reaching the summit, also looks down upon Rio and from it I could see Copacabana and yachts rocking in the sea. Rio de Janeiro’s expansive botanical garden, Jardim Botanico, lies in a quieter, greener area of the city. The gardens are home to more than 6,00 species of plants, set on about 350 acres. At this time of year some come here to find refuge from the bustle and din of Carnaval. The official language of Brazil is Portuguese. Bring a phrasebook since most Brazilians do not speak fluent English. Americans need a visa to enter Brazil. While the visa application can and should be downloaded online, you or your paid representative must personally present the application at the Brazilian Embassy in Washington, DC, or one of the Consulate General offices throughout the U.S. The process can take several weeks. Follow the payment instructions carefully. Rio de Janeiro’s international airport, Galeao (GIG), has nonstop connections from New York, Washington, DC Dulles, Houston and Los Angeles, among other cities. Airfares are highest between January 1 and the end of April. A great source of Rio de Janeiro tourism information is the Marvelous City of Rio de Janeiro. It links to many of Rio’s most popular, and some of the lesser-known, tourist attractions. You can find a list of blocos, updated annually, on this website. Am ready for each of this month’s destinations !! Ah…the wonder of inflight WiFi. Such a great report on Rio and Carnaval: I want to go sometime after reading this story. The mother, Beatriz, of one of my musician friends in New York City invited me. You make it sound so much fun and exciting. Thanks!